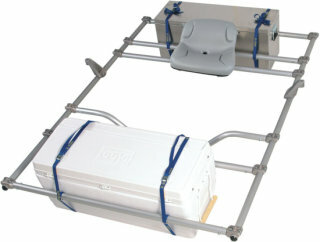 The Bighorn II can carry both a cooler and a dry box, and will fit many boats 14' and longer. Its size and adjustability enable you to carry all the gear needed for multi-day trips. Four 9' NRS straps and eight strap slides are included for securing your cooler or dry box. Like all NRS frames, the Bighorn breaks down into a small bundle for easy transport. Seat, four crossbars, foot bar and oar mounts included. Cooler and drybox sold separately. Please call for information regarding additional options.